Love the colors and rug is well made. 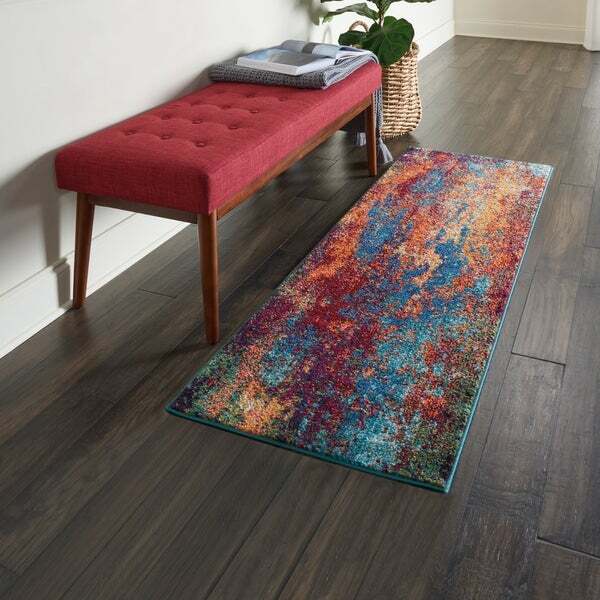 Rug is on vinyl plank flooring and does not require a nonslip mat under it. Cosmic consciousness inspires the Celestial Collection by Nourison. These heavenly area rugs possess a dramatic beauty, with rich, saturated colors that swirl together in unique and vivid designs. Each stunning area rug conveys a sense of movement and energy that verges on divine. Glowing orange, coral and crimson leaves light up an exquisite autumnal azure sky. Featuring a sensational silky texture and breathtaking tone, this Celestial area rug from Nourison is downright dazzling in its dreamy appeal. Dimensions 45.0 In. X 26.0 In. X 0.5 In. I was so happy with my 2’2” x 3’9” carpet that I ordered large one for my living room! Colors are amazing and it is easy to clean. Smaller rug needs rug pad to stay in place since it doesn’t have rubber backing. Love it! Absolutely beautiful, bright colors. So many comments and compliments already. Just wish it had a non-skid bottom so we don’t have to use a rug pad. Beautiful rug that looked terrific in my space. It is well made and exactly as pictured. The colors are beautiful. I purchased this go with my teal leather furniture and it matched beautifully. Love this!!! Adds color and whimsy to to my hallways! Well made and very happy with it! I bought three to use in my dining room. They are beautiful and soft to the touch. I actually liked this particular pattern for adding a splash of color to my decor! Nourison Celestial Atlantic Red/Blue Abstract Area Rug - 3'11" x 5'11"
Nourison Celestial Atlantic Area Rug - 7'10" x 10'6"